Nothing fully prepares you for the birth of your first child, but having a doula is like having a secret weapon...or professional angle-astronaut guide on an epic journey to the moon. There are so many unexpected challenges. Even though we knew there was a good chance I would have to go the cesarean route, I am so very grateful we signed up with Krista Sullivan specifically! Her doula style is that of a humble hero. We benefited greatly from her guidance before, during and after the birth of our child. She provided me and my husband with countless insights and tricks along the way. Her presence is so comforting and supportive. Just one of the many examples: Breastfeeding was among the hardest challenges and when my milk supply suddenly plummeted unexpectedly, I could have fallen into despair. Our baby was born at 10lbs, but was struggling to grow fast enough to maintain his percentile - the pediatricians had us on high alert. Krista showed up at my door with a whole power pumping regiment to jump start me back. She either knows the answers or can pull in the experts who cover a whole range of services. It is 5 months later and thanks to Krista’s support in the early days, our sweet little babe is growing well and still breastfeeding today. Do not delay! Reserve Krista as you Doula, angel-astronaut guide to the awesome out of this world adventure of becoming a parent. I planned to have a Home Birth after a Cesarean, and I knew I wated a doula even though I had already hired midwives. And I'm glad I did. My labor progressed very quickly, but that also meant I had contractions almost non-stop from 3:30-6:47. When Krista arrived, I was exhausted and thought I was going to go crazy from the back labor (my water broke first, too). She walked right into my living room, with me in very active labor in the birth pool, and three midwives, my husband, and cat, all gathered around helping. I have no idea how she did it, but she reached into the tub and grabbed my back in a certain way, and it was the first time I had felt relief in hours. After she got there I really felt like the pain was manageable. By the time we switched positions to encourage the baby to come out Krista held my hands and helped me focus my breathing and pushing smoothly, so that I avoided any tearing. I absolutely cannot recommend her enough. I highly recommend Krista. She did a great job preparing me for my birth and helping pull together my birth plan. I had to have a c section and she was in the OR with me making sure everything went exactly how I wanted it to and stayed with me for my first day of recovery. ​She will also be helping with getting my sea legs over the coming weeks! Highly recommend her for anyone on the Cape or in Boston delivering! When I first got pregnant I knew I wanted to have a natural unmedicated labor. From my reading, I knew that having a doula present significantly increased the odds of that happening, so I found and hired Krista when I was just ten weeks pregnant. Her support throughout my pregnancy was wonderful. I’m currently living far away from where I consider home, and just having someone I could talk to and ask questions of was a huge blessing. As my due approached though, it became apparent that my sweet little girl had plans of her own. She was quite stubbornly breech, and despite all efforts to encourage her to turn over, she refused. I was devasted that I would require a c-section, not to mention terrified. 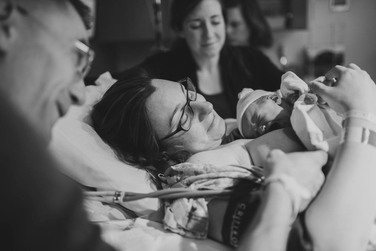 Krista did all kinds of research for me about gentle c-sections, and things we could do to make it feel more like birth, and less like surgery. When the scheduled day arrived she came with my husband and I as we waited for hours for the OR to be available. Her kindness and steady presence helped keep me calm through that time. And in the days after my daughter was born and we got such conflicting information regarding breastfeeding, and the difficulties we were having, Krista helped remind me to trust my instincts as a mother and be a good advocate for my baby. I wish I could have had Krista’s support through labor and vaginal birth as I had planned, but that support was even more needed when things didn’t go as planned, as they do often do where babies are concerned! There just aren't adequate words to describe what a blessing Krista was to us during my labor and delivery. Mutual friends recommended her to me and I'm so grateful they did. My labor and delivery ended up being extremely complicated, long, and difficult. Krista was there to support me in the most trying moments of my life so far. Her gentle yet assertive manner really made a difference for both myself and my husband. Throughout my pregnancy I often wondered if I really needed a doula or not, especially because I have a very supportive husband. But once my labor started to get complicated, I knew I'd made the right choice hiring Krista. Having someone who knows what they're doing and that had taken the time to also get to know my husband and I as individuals really was a game changer. If you work with Krista, you won't regret it. She'll forever be a part of our lives, as she helped us bring our most precious little girl into the world. I can't say enough about Krista and how special she is! ​"Where do I begin to tell you how AMAZING Krista was as my doula!?! Half way through my pregnancy, I was unsure of what a doula did and whether or not I even needed one. After all, this was my second child and my boyfriend planned on coaching me throughout labor and delivery. I had given birth before but my gut told me to hire a doula this time. It was the best decision I could have made for my family!!! Krista was amazingly caring, calm, thoughtful, organized and informative. She was always available to answer my questions, calm my fears and help me plan. My labor was a 29 hour whirlwind of strong, intense back contractions. I am so happy to have had Krista working as a team with my boyfriend at home and in the hospital. I needed them both on either side of me, one for counter pressure, and one to hold my hands. I needed them both when I could no longer communicate with hospital staff. I am beyond grateful for everything Krista has done for my family before, during and after my daughter's birth! "It was such a wonderful experience having Krista as our doula. I don't know what we would have done without her! She was great at checking in with me throughout the pregnancy, seeing how I was feeling, helping to allay any fears I was having about the process. I truly cannot thank her enough for how wonderful she was to us throughout the pregnancy and intrapartum experience. She also helped me to put together a cohesive birth plan so I would be ready for the big day. I went into labor suddenly a day before my due date, and Krista was at our side within minutes of our calling her. She was indispensable as I experienced incredibly strong contractions (arrived at the hospital 6cm dilated and was to 10cm within an hour, and this was my first baby!) and a very long time of pushing to get baby girl out. She was unbelievably respectful of my wishes, and so supportive of whatever intervention I was requesting or needing. She worked seamlessly with my doctor, husband, and the nurse to form a supportive care team that had the best interests of myself and our baby girl at heart. And in the end I got the unmedicated, natural birth that I had hoped would be possible for my baby girl! After the birth she has been wonderful at checking in to see how both myself, my husband, and baby girl are doing. I have always gotten a strong sense of how much she cares for her clients, and how passionate she is about ensuring that they have the best birth experience possible. You will not go wrong with choosing Krista to be your birth doula. I couldn't think of anyone I would have rather had by my side (besides my husband) in making me feel as supported as possible for the birth. Don't hesitate to contact her for more information!"